Purchase in groups or as individual components. Granite and graphite or maple and silver melamine finish resists scratches, stains, burns. Fully reversible components. Assemble as right or left side arrangement. GROUP A: Includes corner desk with hutch, bow-front conference desk, lateral file with 2-door hutch, 5-shelf bookcase, 1 file drawer, pull-out keyboard shelf and mobile CPU platform. Overall: 116-7/8"Wx88-7/8"Dx64-3/8"H; 528 lbs. 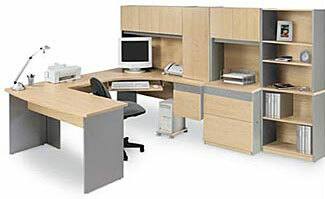 GROUP B: Includes corner desk with hutch, pull-out keyboard shelf and mobile CPU platform. Overall: 60-7/8"Wx65-5/8"Dx64-3/8"H; 243 lbs. GROUP C: Includes corner desk with hutch, bow-front conference desk, 1 file drawer, pull-out keyboard shelf and mobile CPU platform. Overall: 60-7/8"Wx88-7/8"Dx64-3/8"H; 317 lbs. CONFERENCE DESK: Use as a free-standing desk or group with corner desk to create a U-shaped configuration. Overall: 59-7/8"Wx23-1/4"Dx29-3/4"H.
TWO-DRAWER LATERAL FILE: Ball-bearing slides on locking drawers; holds letter and legal size hanging files. Overall: 28"Wx19-3/4"Dx29-3/4"H.
TWO-DOOR FILE HUTCH: for placement on 2-drawer lateral file; 2 storage compartments; one grommet allows for wire pass-through. Overall: 27-3/4"Wx12-1/2"Dx34-3/4"H.
Uniquely designed files help maximize every inch of space. Accommodates letter or legal-size hanging file folders as well as EDP suspended data binders. 5-drawer file can also house 3-ring binders. 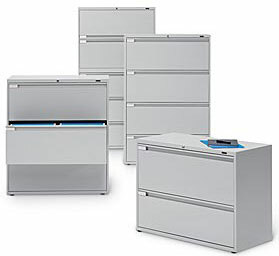 5-drawer file features top drawer with receding door to house 3-ring binders or hanging folders. Full-extension ball-bearing suspension prevents drawer bounce back. Positive interlocking system allows only one drawer to be opened at a time. Locks and side-to-side hanging file bars are included. Front-to-back hanging file bars and master key for locks available. 5-drawer cabinet has top drawer with receding door for 3-ring binders or letter/legal file folders. Second drawer holds letter/legal hanging files and EDP data binders. ** Remaining drawers accommodate letter/legal hanging files. **Optional adaptor #GLF-AD required for EDP binders. 5-drawer file top drawer shown with EDP folders. 5-drawer file top drawer shown with file folders. NOTE: Other colors are available. Call customer service for choices. Allow longer shipping time.